A growing body of empirical research on the crossmodal correspondences, that is, on the associations between abstract features that we share across the senses, demonstrates that people associate (gustatory) tastes and visual shape features in a non-random manner. Such abstract features of shapes (e.g., symmetry or curvature) can, under certain circumstances, guide our taste expectations and even taste experiences. Here, it isargued that the different dimensions of the shapes associated with our food experiences, such as the tableware (what some have calledtablescapes), the way in which we plate the food, and the food itself, mayall impact the expected and experienced taste of food. Further, we discuss how food experience designers (think chefs, culinary artists, and food companies) may capitalize on these recently-discovered correspondences when designing dining experiences and present directions for future research. Visual information normally plays acriticalrole when it comes to setting our expectations and experience of what we eat and drink[1-3].This idea not only relates to the visual properties of foods and drinks themselves, but also to the tools that we use to eat with, and the way in which the food islaid out on the plate; even the shape of the plateware itself has been shown to matter [4-7].This short review detailshow the different shape dimensions that are associated with the aforementioned elements can influence (or prime) people’s taste expectations and experience. In recent years, research has pointed to the fact that the associations between abstract features across the senses (e.g., taste qualities, colour features, shape attributes, sonic parameters, and so on), or what are also known as crossmodal correspondences [8,9], can influence taste expectations and experience .That is, people not only relate taste with the other senses based on an object’s identity or meaning (or semantic congruence, e.g., think only that cucumbers tend to be green, ), but also as a function of some more intriguing abstract dimensions across the senses (e.g., the brightness of that green hue likely signals something about the taste of the cucumber as well as other fruits and vegetables). For example, when people are asked to match basic tastes and shape curvature, they tend to associate sweetness with rounder shapes, whilst matching bitter and sour tastes with more angular shapes instead (e.g., ). Note that the shapes we associate with tastes are not necessarily determined by the shape of the foodsthemselves, instead, the idea here is that, on average, foods associated with rounder contours will be more strongly associated with sweetness than those with more angular contours. This kind of information can be used to systematically create specific taste expectations and experiences (think, for example, of the shape in which the food is plated on a dish). Here, we concentrate on crossmodal correspondence between taste and shape in the context ofeating. In particular, we focus on the influence of the form of the food, the way in which it is plated, and the shape of the tools that we use to eat with, on our tasting experiences[13,14] (Figure 1).The hypothesishere is that the visual features of the shapes associated with our eating experiences can be critical in determining people’s taste expectations and experience (see ). Note that we focus on the relationship between shape features and taste attributes (not ‘flavour’, which results primarily from the integration of taste andretronasal olfaction, see [15,16] for reviews). First, we present an overview of crossmodal correspondences. Next, we introduce the literature on the crossmodal correspondences between taste attributes and shape features. We then move on to present some examples of how the shapes associated with our eating experiences can influence the taste experience of the food. Finally, we present directions for future research and some general conclusions. Figure 1.The shape of our food experience. Note that the shape of the tools we use to eat, the shapes that result from the way we plate, and the form of the food itself can be modified in order to modify our food expectations and hence our food experiences. In this figure, we present schematic variations of the shape of the plate, plating arrangement, and food (squared vs. round). Crossmodal correspondences refer to the frequently surprising interconnections between abstract dimensions or features across sensory modalities (what are sometimes also referred toas synaesthetic correspondences, [8,9,17],for reviews). A number of elements characterize crossmodal correspondences: They are based on mappings between distinctive features (or dimensions) across the senses, they provide complementary (non-redundant) information during perception, and they ofteninduce congruency effects, which are sometimes a product of a relative compatibility between the different sensory features . Moreover, crossmodal correspondences are thought to provide relevant information to people when inferring and perceiving information in the often noisy multisensory world in which we all live. Relevant to the food context, research shows that, for example, people associate tastes and colours [19,20],sonic cues ,shapes [22,23],and tactile cues . Note again, that these associations are based on features that do not necessarily belong to the same identity or meaning (as in the example of green and cucumber).These and other associations add weight to the fact that the perception of foods and drinks is multisensory in nature, and that extrinsic cues such as those that relate to vision and audition, can also exert a significant effect on our food experiences [10,25]. Spence outlined a taxonomy of the putatively different types of crossmodal correspondences .Thisnon-mutually exclusive listingincluded structural, statistical, and linguistic as the three fundamental types of correspondence. Structural correspondences refer to those that are based on similarities in the way in which our brain codes features (e.g., intensity across the senses, see, for an example). Statistical correspondences are based on the statistical regularities of the environment, and thus, may emerge as a result of associative learning (e.g., one example here being the correspondence betweenpitch and elevation, ). Linguistic correspondences refer those matchings that arise in synesthetic metaphor, when descriptors in one modality applied to those in another (e.g., ). Potentially, linguistic correspondences may be based on statistical correspondences as illustrated by the association between pitch and spatial elevation, where people use the terms ‘high’ or ‘low’ to describe a sonic parameter . This idea reflects the fact that the different types of correspondences need not be mutually exclusive. Recently, Spence et al. also referred to the idea that other crossmodal correspondences may be based on people utilizing the available heuristic. For example, when people estimate the taste of a food based on its colour, one possibility is that they use a common food with that colour to guide their association. Moreover, although Marks  and Spence  both acknowledge the possibility that some crossmodal correspondences can be mediated by affect, neitherresearcher discussed the affective correspondence account in detail. Nonetheless, several studies have suggested that some correspondences may be a product of a common feeling evoked by the associated sensory dimensions [19,23,27-29]. Velasco et al. recently suggested that taste-shape correspondences may be, at least in part, mediated by the affective properties of both tastes and shapes. This suggestion emerged from two ideas. First, people match sweetness with rounder shapes and the other tastes with more angular shapes .Second, people seem to prefer sweet tastes  and round shapes , as compared to, for example, bitter and sour tastes, and angular shapes, respectively (something similar may happen with other shape features such as symmetry). With these arguments in mind, affective correspondences may be tested in dining environments by using taste qualities (or flavours with such qualities) and shape features that influence visual preference. Next, we consider those visual features that have been shown to influence visual preference and which may be associated with tastes.Then, we summarize what it is known about shape/taste associations in dining environments. In their review paper, Palmer, Schloss, and Sammartino summarize the literature on visual aesthetics and preference and consider object features of shapes such as the golden ratio, complexity, symmetry, contour curvature, and the extent to which an object shape resemble a categorical prototype. In general, there seems to be a tendency for people to prefer objects whose shape are near to the golden ration ,that are symmetrical ,that have a round contour ,and that bear a resemblance to categorical prototypes . Importantly though, visual preference may differ across individuals .So, for example, individual differences and context-related influences have been reported in respect to the preference for the golden ratio [33,37]. Additionally, although it seems that people prefer curved objects, design trends in specific object categories may, to some extent, influence object contour preferences (e.g., the car industry, ). Moreover, visual preference for round objects can be mediated by the valence of the object itself. People seem to prefer curved over angular objects when such objects are either neutrally- and positively-valenced.However, such differences are not always present in those objects that are negatively-valenced.Whilst this idea has not been tested in the context of food specifically, it is nevertheless intriguing, in that curvature may not necessarily influence the appeal of a negatively-valenced food. Note that there are other object features related to the spatial structure of objects that can influence visual preference as well. As suggested by Palmer, Schloss, and Sammartino, low level visual properties, such as spatial frequency, and the spatial composition of elements, which includes, for example, the balance of an array and/or how central objects are laid out, can also influence visual preference (e.g., [5,40,41], for food-related examples). It is fair to say that given the fact that we first process food visually , all these elements may potentially influence how we expect and perceive the food we eat. Indeed, the different characteristics of the food can be informative when assessing the properties of the food . Taste/shape correspondences may be, at least in part, explained in terms of affective correspondences, though research is still needed to provide further evidence that clarifies the scope of that account .It appears that positively-valenced shape features tend to be associated with sweetness whereas less positively-valancedshape features with the other basic tastes . A number of studieshave, for example, demonstratedthat people tend to match rounder abstract shapes (i.e., shapes without a specific identity or meaning) with sweet tastes and flavours having sweet attributes [22,43].Note, however, that Bremner et al. reported a study in which they found that people in a remote area of Namibia matched bitter with round shapes, which contrasts with the results obtained with western participants(e.g., ).Bremner and his colleagues suggested that different food and/or shape preferences may have explained the different matching. Whilst this study is the only one of its kind to have been conducted in the context of taste-shape correspondences, it highlights the potential existence of cross-cultural differences in the way people associate tastes with shapes. Curvature is not the only feature that seems to drive people’s taste-shape matches. Salgado-Montejoet al.recently provided evidence in support of the notion that sweet tastes tend to be matched to shapes that are symmetrical and that have fewer objects when compared with sour tastes. The associations between tastes and shapes also appear in our everyday language with sentences such as “square meal”, “sharp taste”, and “well-rounded” (the latter, in the context of wine), often being used to describe foods and drinks with different characteristics. There is also initial evidence to suggest that (at least) shape curvature can induce crossmodalcongruency effects. Indeed, congruent vs. incongruent shape mappings seem to influence expectations ,perception [47, 48],and taste sensitivity ,both at the perceptual and semantic level .As we will see throughout the next sections, further research is still needed in order to elucidate whether these effects extend to other features of shapes, and whether they extend to the different objects associated with our dining experiences. Let us consider the objects related to our taste experiences and their respective shapes. As shown in Figure 1, the proximal objects embedded in our eating contexts include, among others: the shape of the tableware, the way in which the food is plated, and the shape of the food itself. All this elements have the prospective to prime specific notions in the diner’s mind [51; cf. 47].Here, however, it is important to acknowledge that only some components of the tableware and the food itself will be end up in our mouths, and only the latter will be ingested. Thus the shape of the food may be especially important for our expectations and experience of the food (e.g., it can impact directly on the organism during the process of ingestion, ). Given the many different objects that are part of our eating experiences, and their respective shapes, it is perhaps important to reflect on which of those will come to exert an influence on our experience. As we will see later, while some of those elements have been shown to influence the experience of the food’s taste, researchers tend to focus on the shape of one or two items at a time. How do the studies utilizing basic tastes and abstract shapes extend to dining contexts? When eating, people have to deal with many different environments and objects, and their corresponding shapes[e.g., 53,54,55]. Potentially, the alignment or misalignment of these elements with either polarity of the different shape features presentedearlier, may influence both taste expectations and experience, at least, under certain circumstances. Below, we present some of the studies that have dealt with the influence of food, plating, and/or tableware shapes on taste expectations. Stewart and Gross  conducted a study in which they manipulated both the colour (black vs. white) and shape (round vs. squared) of a plate and assessed its effects on participants’ ratings of the quality and taste of a piece of cheesecake. These researchers documented a significant main effect of colour on sweetness ratings, with the food in the white plates resulting in higher ratings than the food in the black plates. Moreover, they also found a significant interaction between colour and shape. 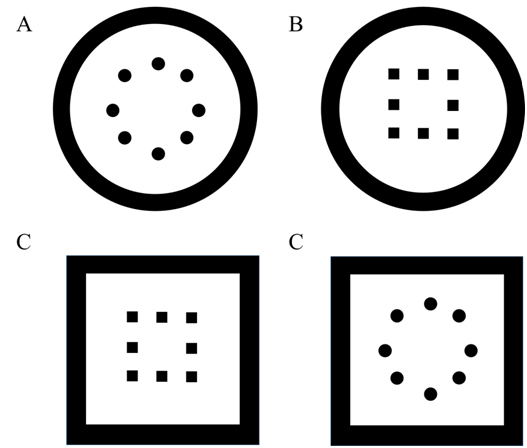 Round white plates resulted in higher ratings of sweetness than square white plates (eliciting an approximately 20% change in ratings, Figure 2).Note that one possibility here is that main effect of shape did not reach significance given the strong association which seems to exist between bitterness and black (e.g., ). Figure 2.Results obtained by Stewart and Gross  [Figure adapted from © 2013 Stewart and Goss; licensee BioMed Central Ltd. Creative Commons Attribution License http://creativecommons.org/licenses/by/2.0. An electronic version of this article can be found in the following link http://www.flavourjournal.com/content/2/1/27]. Along similar lines, Fairhurst, Pritchard, Ospina, and Deroy recentlyreported a study in which they manipulated the shapes associated with both the tableware and food presentation. In particular, they evaluated the effect of dish shape (squared vs. round) and the shape in which a food (beetroot jelly) was presented (i.e., angular vs. round) on the experience of the food. For the taste ratings, the authors calculated the difference between the ratings in the congruent (e.g., square plate and angular dish) and incongruent (e.g., square plate and round dish) conditions for both sweetness and sourness. The results revealed that the food was rated as sweeter when it was presented in its round form and on a round plate (congruent) than when it was presented in its angular form and on an angular plate (incongruent). However, no significant difference was found in terms of sourness ratings. Something interesting to note here is that, whilst Fairhurst and her colleagues manipulated the plate shape and the food presentation, the food’s plating followed a circular shape in all conditions. As the food plating was kept constant across conditions, the differences are likely to be there even if another plating design is used and kept constant across conditions. However, it is not possible to assert from their data whether the plated circle may have added something to the congruency effect for sweetness or not(Figure 3). Figure 3. (A) The different plate and presentation conditions utilized by Fairhurstet al. and (B) Sweetness ratings [Figure adapted from © 2015 Fairhurstet al. ; licensee BioMed Central. Creative Commons Attribution License http://creativecommons.org/licenses/by/4.0. An electronic version of this article can be found in the following link http://www.flavourjournal.com/content/4/1/22]. The way in which taste perception is influenced by shapes may not only be limited to the shape of the tableware or the food presentation, as mentioned before. Indeed, the typefaces associated with the name or description that is used for a particular food can also influence the associated taste. Velasco et al. found that those typefaces that were considered as easier to process and that were liked more (round typefaces), tended to be associated with sweetness, while those that were rated as less easy to process and that were liked less (angular typefaces), were associated with sour, salty, and bitter instead. With the aforesaid results in mind, it is possible to affirm that the curvature of the shapes associated with our eating experiences can influence taste ratings. However, not all previous studies have pointed in the same direction. Take, for instance, the results of a study reported by Youssef et al..In one of their experiments, they found that participants expected the food to be more savoury (or less sweet, utilizing a scale ranging from sweet to savoury) when presented in a linear as compared to a circular fashion. However, in another experiment the authors failed to find anysuch effect, though in this case they assessed the taste ratings with a sweetness scale. These results may respond to methodological differences and are worth considering given that the information in which people focus (e.g., what people are asked about) can influence how they respond to foods .Here, it isimportant to recall the fact that crossmodal correspondences are thought to produce relative rather than absolute compatibility effects . That is, when two shapes having different curvatures and two tastes having different qualities (e.g., sweet and sour) are presented, the round shape may have a higher chance of being associated with sweetness relative to both the angular shape and a sour taste. In other words, contrast is necessary for congruency effects, in the context of crossmodal correspondences, thus highlighting the relative nature of their effects. This may be reflected in Youssef and colleagues’ study in that in one experimentthey used a scale anchored with sweet and savoury, but in the other they used a sweetness scale.Another potential explanation for Youssef et al.’sstudy concerns the idea that people’s attention may need to be drawn to the shapes that are involved in a particular food experience, in order for them to exert an effect on the diner (i.e., shape perhaps needs to be made salient somehow). Another important element to emerge from Youssef et al.’s study is that, whilst people preferred the linear presentation, they did not necessarily expect the taste to be sweeter. On the basis of such a finding, it should be highlighted that utilizing pleasing visual presentations may not always lead to sweeter associations in specific foods. Nonetheless, in theory it is plausible that, in general and across food-related shapes, preferred shape designs will be more likely to be associated to sweetness than their non-pleasing counterparts .Further research will be critical in testing such a hypothesis. One legitimate question to be asked here concerns whether one should always focus on congruent vs. incongruent shape and taste attributes when designing food experiences. Whilst the role of congruency has been discussed extensively elsewhere [20,60-62],a few points relevant to the present articlewill be highlighted. First, at the level of expectations, congruence may lead to more positive experiences, which may result from the (higher) fluency with which the foods may be processed (perhaps, some foods may traditionally be served in certain shapes, e.g., crème brûlée tends to be presented in a round cup and form). Nonetheless, a certain level of incongruence may surprise the consumer in a positive way, provided that they are given the tools to solve the incongruence, and believe they are in the hands of an expert, or designed experience.Most importantly, at the perceptual level, the shape features associated with our food experiences may be utilized to ‘season’ the food. For example, by increasing the contrast between the food elements and the shapes that they contain, it may be possible to keep the same level of perceived sweetness by means of shape features (even when modifying the concentration of a taste in the food).Again, further research will be critically to assess such a possibility. This paperreviews the recent developments in the study of the crossmodal correspondences as they relate to the context of food experiences. In particular, the focus has been on the associations that we share between tastes and shape features. It wasshown how it is thought that, at least in part; such correspondences may be mediated by affect. The need for further research to test this account was highlighted, though. Then the role of the shape features associated to people’s eating experiences was discussed. Different shape-related visual featuresof elements such as the tableware, food plating, and the food itself, can potentially influence the experience of the food’s taste (this does not exclude other elements associated with foods and drinks such as, for example a packaging’s label). Thereafter, the concept of taste/shape congruency in food experience design was briefly introduced and it was suggested that both congruence and incongruence may be effective strategies, depending what one wants to achieve. There are a number of directions for future research on taste/shape crossmodal correspondences and also their applications to the world of food design. First, it may be interesting to document and explain how tastes relate to other, less explored, dimensions ofshapessuch as the golden ratio and complexity, as well as other object elements that include their low level features (e.g., spatial frequency) and their spatial composition of objects (e.g., balance or how centrally are items arranged, e.g. ). Based on previous literature, it is reasonable to hypothesize that, at least those features that influence visual preference, may influence the correspondence between taste and shape. Nonetheless, research is still needed to clarify whether the affective account of taste/shape correspondences holds. Certainly, basic tastes provide a controlled but limited way of studying these correspondences. Future research may extend the results presented here to both retronasal and orthonasal odours with different qualities and hedonic properties. In line with these thoughts, and as suggested by Velasco et al., it is vital to clarify whether people match sweetness to roundness and symmetry or whether it is the hedonic character of the taste alone, what is matched to those shape features. A number of venues for future research can be thought of when it comes to the application of taste-shape correspondence research in the context of food design. As suggested throughout the manuscript, several shape features associated with the objects that are part of our food-related environments can be manipulated. In other words, one may look at the curvature of food’s form, the balance of the plating of the food items, and the symmetry of the plate itself. It would be interesting to look at both when and how manipulating the shape of these elements throughout the eating experience influence the expectations and experience of the food’s taste. Here, it is also important to look at whether people need to be aware of and/or engage with an object and its shape in order to have an observable influence on the taste experience (cf. ). Here at the Imagineering Institute (http://www.imagineeringinstitute.org), we are also working on digitizing taste experiences. Recent research has forwarded both taste and smell digital technologies such as Digital Sour Taste Interface ,Thermal Sweet Taste Interface , and Scentee. Thehope is that the literature on crossmodal correspondences may help to enhance digital taste and smell communication (see , for a review). What is more, future tasting and dining environments are increasingly involving technology , thus the objects of the future dining experiences will be mixed digital/physical, which will open up a number of opportunities for food experience design  involving taste/shape correspondences. Finally, although one may propose specific hypothesis about the different outcomes of taste/shape congruency manipulations in food design,further experimentation is undoubtedly still needed. So, for example, could one potentially utilize taste-shape correspondences in food design for clinical populations? How do shapes interact with other visual features (e.g., brightness) in setting up taste expectations or influencing its perception? Do the same mechanisms apply? Answering these kinds of questions may help to gradually approach the complex world of crossmodal correspondences in relation to food. People associate shape features to tastes in a non-random way. Every time that we find ourselves in a food-related context, we are exposed to a number of objects whose shapes can exert an effect on the way we expect and experience the taste of the food. On the one hand, studying such crossmodal correspondences may provide insights as to how and why the form of food-related objects impact taste experiences. On the other hand, from a practical point of view, it is possible to capitalize on those correspondences to enhance people’s taste experiences. Spence C, Piqueras-Fiszman B (2014) The perfect meal: The multisensory science of food and dining. Oxford, UK: Wiley-Blackwell. Michel C, Velasco C, Gatti E, Spence C (2014) A taste of Kandinsky: Assessing the influence of the artistic visual presentation of food on the dining experience. Flavour 3: 7. Michel C, Woods AT, Neuhäuser M, Landgraf A, Spence C (2015) Rotating plates: Online study demonstrates the importance of orientation in the plating of food. Food Quality and Preference 44: 194-202. Marks LE (1978) The unity of the senses: Interrelations among the modalities. New York, NY: Academic Press. Velasco C, Wan X, Knoeferle K, Zhou X, Salgado-Montejo A, Spence C (2015) Searching for flavor labels in food products: The influence of color-flavor congruence and association strength. Frontiers in Psychology 6: 301. Velasco C, Woods A, Deroy O, Spence C (2015) Hedonic mediation of the crossmodal correspondence between taste and shape. Food Quality and Preference 41: 151-158. Deroy O, Michel C, Piqueras-Fiszman B, Spence C (2014) The plating manifesto (I): From decoration to creation. Flavour 3: 6. Spence C, Piqueras-Fiszman B, Michel C, Deroy O (2014) Plating manifesto (II): The art and science of plating. Flavour 3: 4. Prescott J (1999) Flavour as a psychological construct: Implications for perceiving and measuring the sensory qualities of foods. Food Quality and Preference 10: 349-356. Prescott J (2015) Multisensory processes in flavour perception and their influence on food choice. Current Opinion in Food Science 3: 47-52. Parise CV (2016) Crossmodal correspondences: Standing issues and experimental guidelines. Multisensory Perception 29: 7-28. Parise C, Spence C (2013) Audiovisual cross-modal correspondences in the general population. In J. Simner & E. Hubbard (Eds. ), The Oxford handbook of synaesthesia (pp. 790-815). Oxford, UK: Oxford University Press. Spence C, Wan X, Woods A, Velasco C, Deng J, et al. (2015) On tasty colours and colourful tastes? Assessing, explaining, and utilizing crossmodal correspondences between colours and basic tastes. Flavour 4: 23. Velasco C, Michel C, Youssef J, Gamez X, Cheok AD, et al. (in press). Colour-taste correspondences: Designing food experiences to meet expectations or to surprise. International Journal of Food Design. Spence C, Deroy O (2013) Tasting shapes: A review of four hypotheses. Theoria et Historia Scientiarum 10: 207-238. Fenko A, Otten JJ, Schifferstein HN (2010) Describing product experience in different languages: The role of sensory modalities. Journal of Pragmatics 42: 3314-3327. Collier GL (1996) Affective synesthesia: Extracting emotion space from simple perceptual stimuli. Motivation and Emotion 20: 1-32. Marks LE (1996) On perceptual metaphors. Metaphor and Symbol 11: 39-66. Steiner JE, Glaser D, Hawilo ME, Berridge KC (2001) Comparative expression of hedonic impact: Affective reactions to taste by human infants and other primates. Neuroscience & Biobehavioral Reviews 25: 53-74. Deroy O, Spence C (2014) Can you find the golden ratio in your plate? Flavour 3: 5. Velasco C, Woods AT, Spence C (2015) Evaluating the orientation of design elements in product packaging using an online orientation task. Food Quality and Preference 46: 151-159. Imram N (1999) The role of visual cues in consumer perception and acceptance of a food product. Nutrition & Food Science 99: 224-230. Spence C, Ngo MK (2012) Assessing the shape symbolism of the taste, flavour, and texture of foods and beverages. Flavour 1: 12. Bremner AJ, Caparos S, Davidoff J, de Fockert J, Linnell KJ, Spence C (2013) “Bouba” and “Kiki” in Namibia? A remote culture make similar shape–sound matches, but different shape–taste matches to Westerners. Cognition126:165-72. Velasco C, Salgado-Montejo A, Marmolejo-Ramos F, Spence C (2014) Predictive packaging design: Tasting shapes, typographies, names, and sounds. Food Quality and Preference 34: 88-95. Becker L, Van Rompay TJL, Schifferstein HNJ, Galetzka M (2011) Tough package, strong taste: The influence of packaging design on taste impressions and product evaluations. Food Quality and Preference 22: 17-23. Gal D, Wheeler SC, Shiv B (2007) Cross-modal influences on gustatory perception. Available at SSRN: http://ssrn.com/abstract=1030197. Liang P, Roy S, Chen ML, Zhang GH (2013) Visual influence of shapes and semantic familiarity on human sweet sensitivity. Behavioural Brain Research 253: 42-47. Velasco C, Woods AT, Marks LE, Cheok AD, Spence C (2016) The semantic basis of taste-shape associations. PeerJ. Sobal J, Wansink B (2007) Kitchenscapes, tablescapes, platescapes, and foodscapes influences of microscale built environments on food intake. Environment and Behavior 39: 124-142. Dhillon J, Running CA, Tucker RM, Mattes RD (2015) Effects of food form on appetite and energy balance. Food Quality and Preference 48: 368-375. Reilly R (2013) How to avoid those dinner party squabbles: Sit your guests around a circular table and NOT a square one. Daily Mail Online, 19th June. Downloaded from http://www.dailymail.co.uk/sciencetech/article-2344388/How-avoid-dinner-party-squabbles-Sit-guests-circular-table-NOT-square-one.html on 06/02/2015. Vartanian O, Navarrete G, Chatterjee A, Fich LB, Leder H, et al. (2013) Impact of contour on aesthetic judgments and approach-avoidance decisions in architecture. Proceedings of the National Academy of Sciences of the USA, 110: 10446-10453. Stewart P, Goss E (2013) Plate shape and colour interact to influence taste and quality judgments. Flavour 2: 27. Fairhurst M, Pritchard D, Ospina D, Deroy O (2015) Bouba-Kiki in the plate: Combining crossmodal correspondences to change flavour experience. Flavour 4: 22. Velasco C, Woods AT, Hyndman S, Spence C (2015) The taste of typeface. i-Perception 6: 1-10. Youssef J, Juravle G, Youssef L, Woods A, Spence C (2015) Aesthetic plating: a preference for oblique lines ascending to the right. Flavour 4: 27. Ludden GD, Schifferstein HN, Hekkert PN (2007) Surprising the senses.The Senses and Society 2: 353-362. Ludden GD, Schifferstein HN, Hekkert P (2008) Surprise as a design strategy. Design Issues 24: 28-38. Mandler GP (1982) The structure of value: Accounting for taste. In M. S. Clark and S. T. Fisk (eds. ), Affect and cognition. The 17th Annual Carnegie Symposium on Cognition (pp. 3-36), Hillsdale: Lawrence Erlbaum. Spence C (2014) Assessing the influenceof shape and sound symbolism on the consumer’s response to chocolate. New Food17: 59-62. Hermans D, Spruyt A, De Houwer J, Eelen P (2003) Affective priming with subliminally presented pictures. Canadian Journal of Experimental Psychology/Revue Canadienne de Psychologie Expérimentale 57: 97. Ranasinghe N, Karunanayaka K, Cheok AD, Fernando ONN, Nii H, et al. (2011) Digital taste and smell communication. In Proceedings of the 6th International Conference on Body Area Networks (pp. 78-84). ICST (Institute for Computer Sciences, Social-Informatics and Telecommunications Engineering). Imagineering Institute (2015a). Thermal sweet taste interface. http://imagineeringinstitute.org/thermal-sweet-taste-interface/. Braun M H, Cheok AD (2014) Towards an olfactory computer-dream interface. In Proceedings of the 11th Conference on Advances in Computer Entertainment Technology.ACM 54. Velasco C, Obrist M, Petit O, Karunanayaka K, Cheok AD, Spence C (accepted). Crossmodal correspondences in the context of digital taste and flavor communications. In CHI 2016 Workshop on Touch, taste, &smell user interfaces: The future of multisensory HCI. Spence C, Piqueras-Fiszman B (2013) Technology at the dining table. Flavour 2: 16. Braun MH, Pradana GA, Buchanan G, Cheok AD, Velasco C, et al. (2016) Emotional priming of digital images through mobile telesmell and virtual food. International Journal of Food Design 1: 29-45. ©2016 Velasco C.This is an open-access article distributed under the terms of the Creative Commons Attribution License, which permits unrestricted use, distribution, and reproduction in any medium, provided the original author and source are credited. Imagineering Institute, Anchor 5,Mall of Medini, No.4 LebuhMedini Utara, Medini, Iskandar, Nusajaya,79250, Johor, Malaysia, Tel: +60 07 509 6568; Fax: +60 07 509 6713.